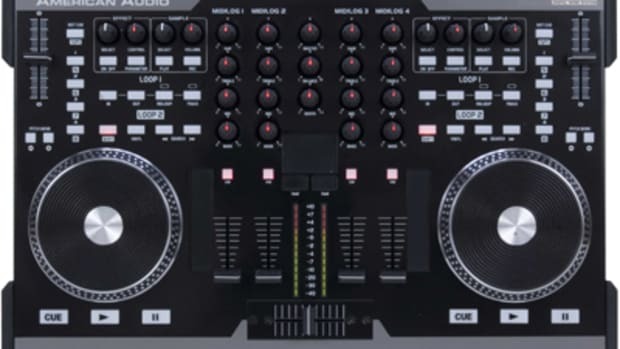 The American Audio MXR-10 is a two-channel USB professional DJ Mixer with an internal 4-in/4-out internal DJ soundcard with additional MIDI buttons and the necessary features to let DJ’s get right into the Digital Mix. The American Audio MXR-10 feels like a professional quality mixer and there is a nice basic feature set that all DJ’s can use to manipulate the music. Watch my full HD-Video review after the jump. 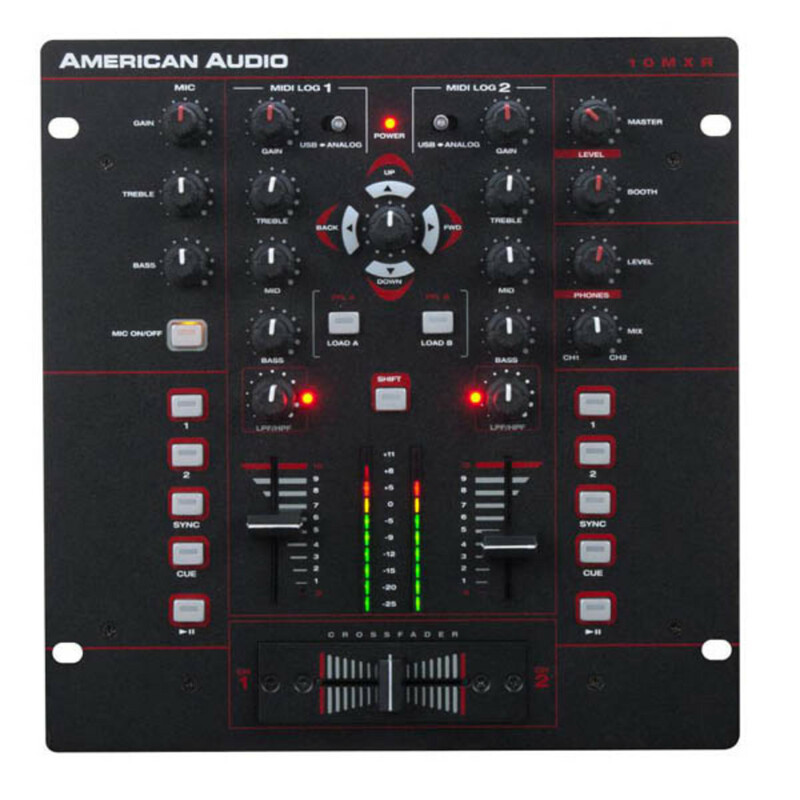 The American Audio MXR-10 is a two-channel USB professional DJ Mixer with an internal 4-in/4-out internal DJ soundcard with additional MIDI buttons and the necessary features to let DJ’s get right into the Digital Mix. The American Audio MXR-10 feels like a professional quality mixer and there is a nice basic feature set that all DJ’s can use to manipulate the music. The MXR-10 is built with a completely solid metal construction, meaning it can take a beating and is nice and compact making it great for the Mobile or traveling DJ. All of the knobs and buttons have a rubberized coating to them making them pleasant to use and a comfortable feel. The MXR-10 can work as a standalone mixer, a USB DJ soundcard, or as a full Digital DJ controller with the switch of a button. The Setup of the American Audio MXR-10 is rather easy. Simply plug the MXR-10 into a computer using the supplied USB cable and run the supplied CD to load the drivers and Virtual DJ LE software. Then connect your speakers via the outputs on the back of the MXR-10 and you’re ready to play. The American Audio MXR-10 has an RCA and XLR (balanced) Master outputs and one RCA Booth output with separate volume knobs. There is also a quarter-inch headphone output on the front panel (no Mini option). On the back there is a quarter-inch Micrphone input and an RCA input for channel one and an RCA input for channel two. The two RCA inputs can be either Line or PHONO level as each RCA input has its own Phono/Line switch and a ground post for vinyl style decks. 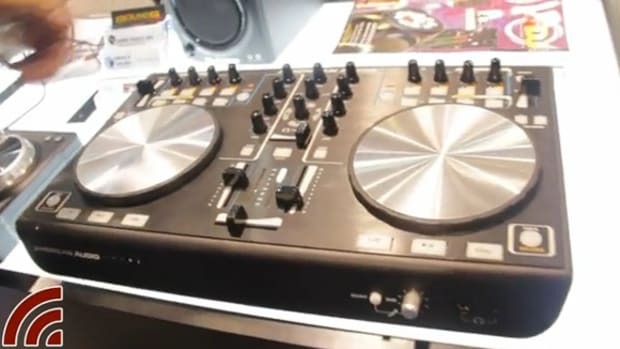 There’s also a standard USB connector on the back for the DJ soundcard and MIDI button connectivity. The crossfader of the American Audio MXR-10 is decent for mixing and OK for scratching. At its sharpest curve setting, the crossfader was only capable of a 3.0mm cut-in distance which made it a bit difficult to get off the quick cutting style scratches. The good news is that the crossfader is easily user-replaceable with screws on the top of the faceplate for a quick change. The popular scratch fader called the Innofader is confirmed as being a good replacement for the MXR-10 and DJ’s who need a better and more customizable crossfader. The linefaders don’t have any adjustments, but they had a bit more resistance to them and they worked generally well for mixing and adjusting the volume. In the middle of the linefaders, there is a level meter to let DJ’s know the volumes of each deck during the mix. Above the line faders is the High and Low Pass filter knob that can be pressed to activate the filter and turned to the right or left to modify the filter settings. This filter control works both in software and without the software connection. Above the filter knob is the standard 3-Band Full-Kill EQ knobs and gain knob at the top. Next to each channel gain knob is the switch that will change each channel to USB (DJ software) or analog mode (external CD or vinyl decks). To the top-left there is a Microphone section with a Microphone on/off button, volume knob, and 2-band EQ knobs. 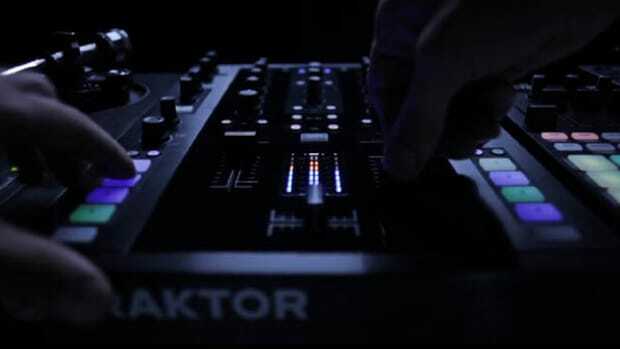 To the top-right of the mixer, there are separate Master and booth control knobs and a headphone volume knob with the Cue channel 1 or channel 2 fader knob. 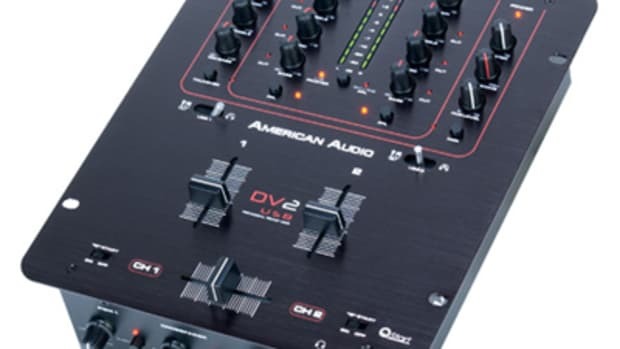 The American Audio MXR-10 mixer-controller comes bundled with VDJ LE so a DJ can use the mixer with internal mode software to mix the digital files without any external decks. There are two hotcue buttons, a sync button, a Play/Pause button and a Cue button for each channel right on the top panel of each channel. 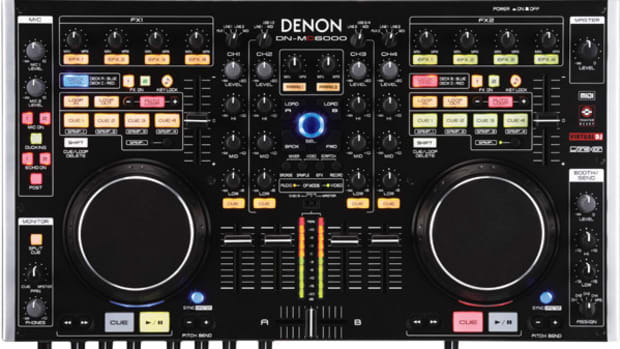 DJ’s can use these buttons by themselves to play whole entire sets as long as everything can be in sync for pleasant mixing. The hotcue and sync buttons double as pitch +/- buttons when the shift button is pressed in case the song tempo needs to change for the mix. The MXR-10 has a nice file navigation section in the middle of the mixer with rubber arrows for directional file navigation and a push-click style knob to scroll through the music in the library. When the song is highlighted, the DJ can then press the Load A or Load B buttons to load the song onto the appropriate deck. The MXR-10 also has a full 4-input & 4-output USB soundcard that can work with almost any Digital Vinyl Timecode system (except for Traktor & Serato) for external deck playback with timecode CD’s or vinyl. Simply connect two vinyl turntables or CD decks with timecode using the RCA ports and you can easily manipulate the music on file using the external decks for control. This feature also worked well with Mixvibes Cross during our testing period. There were only a few minor gripes that I could identify on the American Audio MXR-10 after about two weeks of use. The first one is that the crossfader has a rather long cut-in distance of about 3.0mm until you hear the sound on the opposite deck, meaning that it will take some time to get used to for scratch-happy DJ’s like myself. The second gripe was that even though there is an internal 4-in/4-out soundcard on the MXR-10, you will not be able to use it for DVS timecode playback with Serato or Traktor since their systems only work with Traktor/Serato Certified soundcards. However, this timecode playback system was tested with Virtual DJ and Mixvibes Cross 2.3 and all worked perfectly with basically no detectable latency when scratching or mixing. My last gripe with the unit is the lack of a Master output function for the CUE headphone section. This means that if I want to do some private headphone mixing or scratching, I won’t be able to do it with the standard headphone jack as we can only fade between channel one and channel two using the cue knobs. The American Audio MXR-10 mixer-controller is a nice compact system that has a built in soundcard that is capable of DVS Timecode playback over most Digital DJ Software out on the market today. There are a good number of inputs and outputs to work with a variety of setups and it’s also built to last. The cost of this mixer is only $199 at retail making this mixer a huge value per performance and making it ideal for a great backup mixer or a compact mixer that is great for tight spaces. 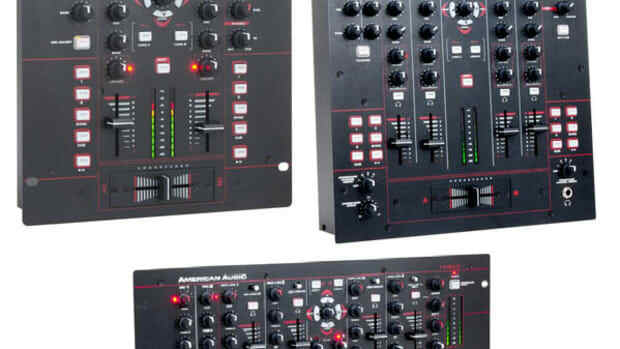 The American Audio MXR-10 mixer is recommended for DJ’s who want to use it as a standalone Digital DJ Software controller with an external mixer or for those who don’t want to purchase a separate mixer AND a separate soundcard for DVS timecode playback. The MXR-10 is also recommended to beginner DJ’s or for those who don’t want an over-complicated mixing and controller system to get them started.